Radiohead’s 2000 Kid A lyrics always managed to both cheer and stir up a sort of anxiety in my chest. In spite of not really being a dyed in the wool Radiohead superfan, I will confess to a deep approval of their obvious successes that easily transcend my well-armed pop music barrier, and reach the receptors reserved for classical artists, the super-endowed that were gifted somehow beyond the ability for many (me, that is) to perceive at least initially. VanGogh, JS Bach, Ralph Vaughan Williams, Bowie, Georgia O’Keeffe, William Carlos Williams, Frank Capra. In 2000 I was nothing if not optimistic. I’d turned 40, but felt like 25. I was done with capitalism as a measure of self worth and also as I braved cutting my tether to the CBOE and the occupation for which I had developed some mastery. The home that was calling me was in the ground and the mountainous shores of the West where I had grown up. Thom Yorke’s desperate drumming became one of the melodic soundtracks to my new freedom. In time it was to become so close to my psyche that, like so much music I adopt, it is nearly a fingerprint or chromosome. And yet, Yorke’s lyrics take on a darker and more desperate meaning in recent times–and not a little unpredictably. As the Orange King takes the throne in mere days (slight nod to fans of Nic Pizzolatto’s Yellow King of Carcosa in True Detective) much that we take for granted in terms of inclusivity and progressiveness lies vulnerable to reversal. Now in my 50s, am I sure that there is a sizeable contingency of fellow citizens who would prefer a separation of status by skin color and origin, and an abuse of the planet beyond repair for the sake of greed? Am I seeing that a leader has been installed who is willing to support such regressiveness, or is he merely satisfied to fan those flames for the benefit of votes? After 40+ years of progress, do I see these things as they exist, or are they merely ads for the mother of all reality TV shows? For now, I’m opting for the latter, and like all reality TV, it is gladly, easily ignored. My street has had a long history of sharing. With black, white, Chilean, Somali, Iraqi, Korean, gay, lesbian, Vietnamese, Mexican, old and young, we’ve never had any option but to share. My contribution is overbought plants that otherwise have no future; they find their way into my neighbors’ yards, which is an interesting way to start a bond that has a way of growing over time. When the block parties and winter bonfires happen, I get to hear the various garden stories while making sure I haven’t left anyone out, or keeping an eye out for new potential gardening neighbors. As surely as our normal winter misty days will take the frost off of this current little cold spell that has us a little irritated, I believe that my neighbors, my good neighbors and I know better than the Orange King that the fabric of America is great–it doesn’t need “making great again”–because of who we are, all of us, with our varied cultures and stripes contributing to the effort. The best that we can do is good enough. When the first English settlers began to hate and reject the Dutch who followed them, who in turn hated and rejected the Germans who followed them, and so on, each succession of the cycle that began with selfishness and hatred was overcome with acceptance, cooperation, inclusion, and love. It is only the final stage of the cycle that is lasting and has any effect on making America great which, in my opinion renders the first part of the cycle counterproductive and illogical. Find someone today, someone you don’t know. Plant something together, something that will grow. There is cause for optimism. March, 2016: I met this 1916 bungalow nearing completion. The carpenters were rebuilding the front porch and steps and getting ready to repaint the house. The homeowner and architect had recently completed extensive rebuilding of the home’s entire interior. In recent years a satisfying number of new and reformed garden designs have become established and their intended purposes really have begun to develop to my great joy. Mostly, however, the work of revitalization becomes so involved and detailed that covering all the steps toward progress in a document generally falls to a series of afterthoughts. I’ve picked Ballard as the challenge to that axiom. Like any new commission, this project keeps me up late with ideas begetting ideas that sometimes cease to rest. But unlike most of the larger residences that I’ve been fortunate to design and implement, this home and its owners have a legitimacy and permanence–those are the purest adjectives I can conjure about them right now–that fosters a deep spirituality of purpose to my task. I can’t remember being any more fervent about designing a property than I am about this pure craftsman bungalow, once likely a Ballard fisherman’s pride and joy, built for his family. What a clean, sincere house; I love it. October, 2016: Time to rescue another western Washington lawn from the climate it is not genetically built to withstand. It’s simple folks: grass is for prairies. This 100-year-old sidewalk will be crushed and repurposed as hardscape support right here on site, saving the landfill and lowering the associated carbon footprint. When facing excavation a feeling of great relief came as I found that my client’s natural gas line was almost entirely off of his property. In the early days of street development of this part of Seattle, the gas lines were often paired up, “twins” they were called. My meter was only a few feet away from the property edge; the utility marked the line as it traveled perpendicular to that line and traveled across to the next home’s meter where it merged into a single supply line that traveled across that property and out to the street. If you’re the excavator this is a giant relief as you will not have to concern yourself over interfering with the gas line. There are other utilities, of course, but none that can result in the loss of numerous lives. Like much of the great Seattle slope bordering the eastern shores of Puget Sound, this soil only a few hundred feet from water’s edge is primarily sand, highly compacted for the most part from 150 years of residential settlement. My present focus is on the hardscape mostly; changing the contour is important given the amount of new stone to be used in this garden. I will be preparing for boulder and riser installation coming ahead soon, and there is a fabulous Acer palmatum Hogyoku to tell you about as well. I’ve got all kinds of good plans for this place. In Georgetown, vandalism of our fair city’s property again. Sakes! I never tasted Big Mike. Unless you were born in the 1940s you probably didn’t either. Gros Michel was the banana, the one single varietal grown and exported by the vast majority of the industry. King Banana. That is, until mid-20th century when a microscopic strain of Fusarium fungus caught and spread more rapidly than could be contained, causing the extinction of the world’s affordable luxury fruit. Growers retooled, costing a heavy capital outlay, and replanted the less flavorful but fungal-immune Cavendish, saving the industry. However, we know today, or began to learn in the 1990s that the insidious Fusarium strain had mutated so as to be able to inhabit the Cavendish variety as well. You can read all about it here. Sadly, bananas aren’t oil. The multi-level cooperation and research needed to reach solutions is poorly funded among the many small state and nation players in the industry. If cooperative solutions aren’t reached, Cavendish’s days are numbered. Consider choosing to becoming a friend to the banana, and I don’t mean on social media; we could be facing a second banana extinction. Not funny. Farther north where my beloved pine and fir based forests face their own ominous forecasts of changing temperature bands, one spots the clearcuts from the car window while driving any state or province highway from the Bay Area all the way up through British Columbia. Only an hour from my home in Seattle one spots Weyerhaeuser’s proudly posted billboards along the raped hillsides “Planted in 2007”, “Planted in 1992”, “Planted in 1969”. Hey, good; that last one is ready for harvest in only three more years! Yes, they’re lumber farms, producing weak, diseased, fast-grown board length in just a few decades. And to make harvesting even more productive, let’s be sure to keep each hectare all one species; we don’t want any mixed forests increasing our costs. And because we’re environmentally minded, as soon as we harvest we’ll replant this mountainside (with a brand new billboard, too), so erosion (probably) won’t be a problem either. Cheap, warped lumber is one problem for builders and consumers, that’s for sure. Landslides, such as 60 miles north of me in Oso, Washington, due in part to unsafe forestry practice helps no one. An even greater problem is when any one of hundreds of microbial phytophthora species infects a monoculture on a mass scale. More than just a few acres of tree farm cedar are killed. Soil borne microbes can live in a dormant stage, without a host, in soils for years or decades. When infected trees are harvested, the sawdust contains viable fungus which can be spread anywhere an unwitting pair of work boots can track it. Usually one has to hike a few miles of forest road to find these guys. This one was right on the mountain highway. It’s nice when the shareholders can get a look from the limo. When two of the largest agrochemical companies connive to merge, Bayer and Monsanto, what gets eliminated is not really the small players or the farmers. And the higher prices that consumers worldwide will pay at the retailers (and consumers will always pay) is not the real price. The real price is that which can not be recovered, namely, biodiversity. Right now that cheap soy milk in your fridge is the product of Monsanto’s patent monopoly on one, just one genetically modified commercially viable soybean cultivar in U.S. capital markets, which is fine for now. Verticillium, a common soil-borne fungus is continuously evolving to be tolerated by a growing list of vegetable and field crops, notwithstanding hardwoods and ornamentals. The University of Georgia has found incidences soybean tolerance of verticillium to be increasing steadily from 1981 onward. Tolerance is first; the next evolutionary step is the ability for the fungus to overcome a plant’s vascular capacity to deliver water and nutrition internally, thereby killing it. Yet, it appears Monsanto fails to find adequate profits in patenting various resistant species of soybeans, choosing instead to risk a complete extinction of its single species to a fungal infection. And why not. The infrastructure for seed to grocery shelf profit model is established for one species, and paid for, as long as it works. The retooling costs to restore the soy infrastructure with whatever backup species awaits in the dugout can be passed on to the consumer easily enough, I suppose, with little harm to execs, board members, and shareholders, and only when it has to come to that. What, if any, research Bayer and Monsanto perform on fungal abatement is either classified or non-existent; finance and accounting may prove that this is not the way to maximize share price. Biodiversity, nature’s preexisting platform, provides the clearest method of keeping all lifeforms in balance, including preventing pathogens from conducting mass extinctions of single species. We know this; science shows us this. But biodiversity can stand in the way of major corporate bonuses to the top 1% when it comes to feeding the world. The monopolization of land and manipulation of species is required to maximize profit. Insurance and other contingencies are maintained in the eventuality that natural resources are exhausted, or altered or contaminated. This is starting to sound like a good rant coming from some chapter of the Occupy movement, and on another day I might-could wear that hat as well. But, this is most definitely coming from a type a sensitivity seared into me more from occupational hazard. Spending so much of each passing year outside, hands in the soil, and monitoring the development and interdependence of land and inhabitants I become highly aware of the lasting effects our developments and decisions have on our Mother. Where crops, gardens, and groves are thriving and good people are directly involved and benefiting from the intersection of effort and sharing, I take note that there is never a monoculture at work. Diversity, biodiversity in the case of the garden, is the commonality consistent with abundance. I don’t expect that any amount of pressure on global manufacturing will foster a dedication to preserving biodiversity in nature; there’s too much profit in GMO’s. If, but for no other reason, you’ve been on the fence about whether or not GMO labeling is even something you’re willing to argue about, perhaps that GMO’s lead to eventual extinction is a good starting place to give it some thought. The morning sun’s in the right place but it’s still not fall. When a person spends well over half his waking time out of doors he loses almost all of his need for dependency on televised weather reports, apps, etc. It’s great fun to look at my iPhone and see that it’s supposed to be overcast with mild showers, when I’m standing under a cloudless sky. Siri isn’t always wrong. I suppose, like the rest of us, she has her off-moments. She has one thing I envy: engineers. At least, in her case, software quirks and shortcomings are always temporary, something about to be known of as former. Ever-vigilant engineering teams expand and escalate her scope and capabilities. Her grasp of global climate and local weather components and all the complexities therein must amount to something like what a planetarium observes moment by moment, silently, infinitely, across the infinite night sky. And, for her somewhat reductive, somewhat flawed presentation of the data, she tells us what she knows right there on our watches, or phones, or…you get it. Though no less lively, the calibrachoa and salvia produce fewer and fewer blossoms. Two hydrangeas paniculata on schedule. They’re white; pink is how they tarnish. Nevertheless, patience being the genetic virtue of the gardener, my eagerness for the resonant hues of the fall color spectrum grows. For all the time I spend inspecting flora I keep expecting to come around some standard corner to the heart-stopping spectacle of a boldly turned Pin Oak. Perhaps, it’ll be a Vine Maple. Maybe even someone’s fine ornamental garden tree, like…like maybe a, like a California Redbud, a Persian Parrotia, or Fothergilla. All it takes is one glorious golden or vermillion show-off Japanese maple, and the rest will fall in for competition’s sake. Come on, you guys, who’s going first? And there, unseen until now, in a back corner of my own yard are two vine maples just starting to turn from the top down. It was another dry summer; color will be strong. A Pacific sunset at the Washington coast. Thanksgiving weekend with no Black Friday. Embrace all nations. Music, not walls. Boston’s Debo Band. Behold pure organic bluster, clamor, klezmer, roar; you might concede your own Ethiopian obsession…1. little cutie muscles the pearl-keyed accordion, 2. oud man is method, 3. LOVE! Bruck Tesfaye’s inimitable voice–wow, this guy is charismatic and what pipes, 4. BRASS! and much, much more. Check out the WNYC Greene Space sessions. First discovered this crew while in Vancouver, and there I was slain. Here’s one visit to my town Debo band at KEXP, Seattle Check out Habesha; it’ll kill ya. Expecting some Pacific bluster on a short holiday trip to the ocean beaches, I was instead met with a virtually windless stretch of sun and solitude. The usual kite flying crew all but abandoned the beaches. It was a solid opportunity to examine coastal vegetation. Restoration efforts have proven successful following broad deforestation. Natives combined with European dune grass form stable, vibrant plant communities that do better than just thrive in high weather and salt spray conditions; they perform soil retention in a perpetually shifting, airborne coastal terrain. American dune grass and Shore pines thrive in the unbridled force of Pacific weather. Thomas Hardy’s short novel Far From the Madding Crowd has provided a sentiment I’ve carried with me since my first exposure to the book back in school. The exaggerated materialism that fuels today’s frenetic and semi-rabid “holiday retail experience” is nothing new; it’s a dated old chestnut, and aging hideously. The human calamity that is Wal Mart on Friday after Thanksgiving is as far from civilization as a demented badger is from tranquility. Though considered cliché, the needed reordering of American priorities from accumulation to minimization has never held more merit than in 2015. Here in a well-ordered environment with a few loved ones, some food and fellowship, I see the hope of the earth in these faces. I see a speck of contented humanity as compared to the dreck of capitalism choking the roads and freeways left over there. I see balance among the elements and foundations of nature working, achieving a goal. Out my window I see see stasis, equilibrium where unstoppable forces meet an immovable object. The power of wave and weather are ineffective against our shoreline where mere plants are the connective tissue. Humble natives salal, Oregon grape, dune grasses, jack pines, and even the inch-high beach strawberry secure a geo-grid that renders a sand foundation stable, functional, effective, and beautiful. It’s kind of the opposite of Black Friday. Oregano, ageratum, and scarlet ivy geraniums await fall’s first frost to end their performance. Flames from a nearby ash attempt to glance the side of the garden shed at Bayside. Finally! At long last, water barrels are filled. Acer palmatum seiryu, the only upright dissectum maple. Would but be symbols of an equal death. It began to seem as though fall would never arrive in 2015. Rain barrels were inhabited by spiders during one of the Pac Northwest’s longest, driest summers in recent times. Begonias, geraniums, dahlias and every sort of summer annual continues to blossom past their usual bedtimes, though inevitably, thankfully, and not a minute too soon, the rains and winds have now returned. These persistent floral companions await certain completion with the arrival of the first frost but, as the song goes: who know where, or when. Past their prime and looking somewhat shabby-genteel, to be certain, their bold color contributions are, in one way, more distinguished under grayer skies and a lower sun. The overlap of the two seasons persists. The first of the deciduous fall leaves have gone for now, though many more are just beginning to show signs of color. Invariably, the flaming orange color of the Japanese Seiryu maple, pictured above, are the last of all the maple trees to lose their foliage, but not this year. The trees are all apparently following an abridged schedule in yet another extraordinary season this year. One fully ironic benefit of the long, dry year, however, is that the fall color display is more deeply intense than in a better hydrated year. Oak, stewartia, maple and others are all beyond saturated, so much so, that my digital camera struggles to quantify the tones accurately–where, oh where has Kodachrome gone? I eagerly anticipate the first frost; these weeds are growing like it’s the Amazon delta. A lesser known benefit of Acer japonicum is that the leaves cling longer to their branches than other species by merit of stronger petioles and later developing abscission cells. Ohanapecosh. Troubling at first sight for some, the word, the river’s name is in fact easily spoken when broken down phonetically. O – ha – na – pe – cosh. Named by a Taidnapam village once situated on the river, it is thought to mean “standing on the edge”. What moved these long-missing first citizens to coin this name? Where have they gone, and why? 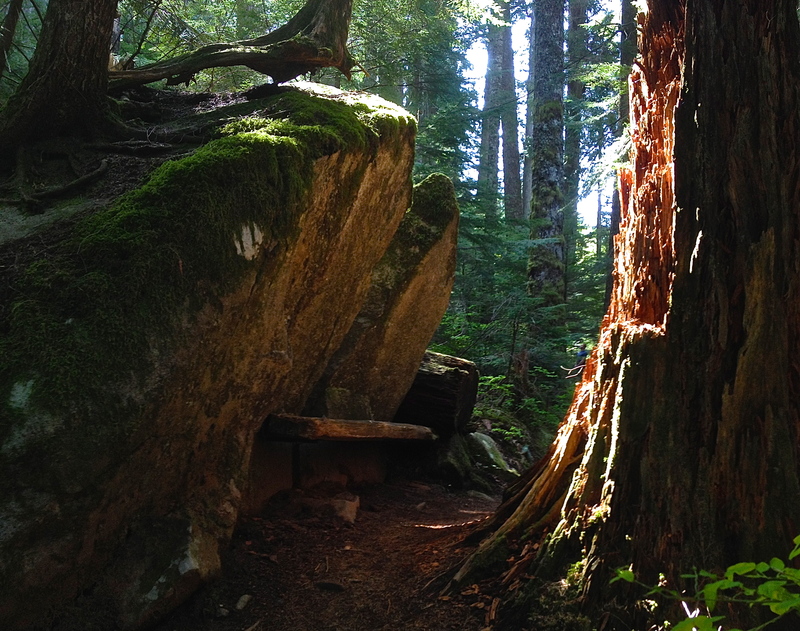 Their secrets are as confounding as the thousand-year-old Western red cedars, Douglas firs, and Western hemlocks that inhabit the banks of this river, particularly those of the island Grove of the Patriarchs, in the remote southeast corner of Mt. Rainier National Park. 300′ tall trees, with 50′ circumferences. Fallen nurse logs lay still and host dozens of conifer seedlings, new competitors for scarcely available scraps of sunlight. These rocks, boulders in excess of 20, 50, 100 tons lay in random fashion, fragments scraped from the mountain by passing glaciers, tumbled, smoothed, and gently deposited miles from their earlier elevation. To look at the face of such a rock is to stare at 10,000 years’ worth of gradual craftsmanship. 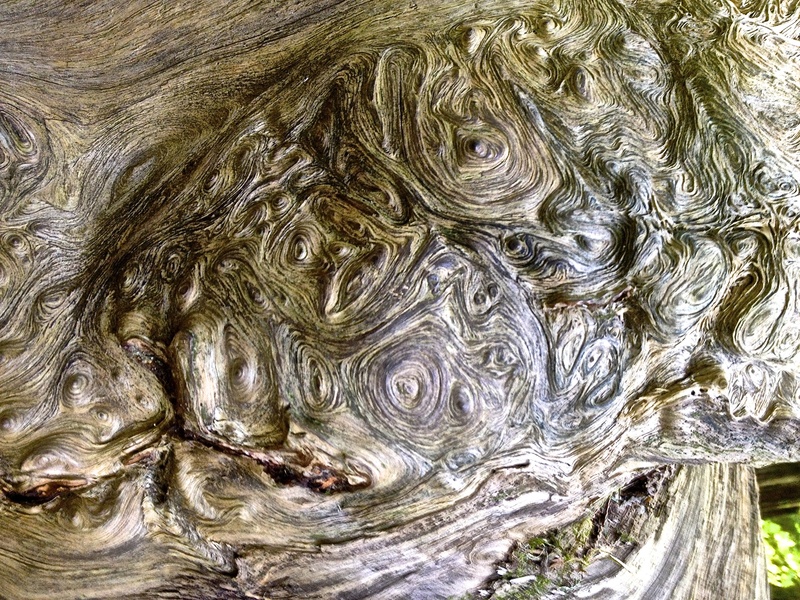 To see the whorls of unabated morphology in a red cedar’s trunk, is to submit to spirits and voices of nature long ago vanished, and if one is listening, still heard and felt in the cool air passing over the pebbly river at one’s feet. Everyone is dwarfed among such giant presences. Submission is automatic. This is not a place for running, shouting, horseplay. This is not a place of worship. This is not a place as places are defined, not the way we see them. A confusion of impressions, emotions really, overcomes the desire to compare or comprehend these spirits. Quiet. Energy. Death. Renewal. Clarity. Conundrum. Voices. Whispers. Thoughts. Thoughts within thoughts. Dreams within dreams. Is this the edge of time? Here, do we feel time brush our skin? There is … a class of fancies, of exquisite delicacy, which are not thoughts, and to which, as yet, I have found it absolutely impossible to adapt to language…. Achlys triphylla, vanillaleaf, when dried is strongly aromatic of vanilla. Trillium grandiflorum evades broad cultivation, but chooses unmolested old growth sites freely. Following only the dictates of nature, this exquisite carpet of vanillaleaf supercedes any manipulated landscape design. The property owner wanted something resembling a traditional Japanese tea house. I wanted a new garden shed positioned farther away from the main house, to reduce time wasted by traveling cross-country for tools or supplies. A compromise was reached; everyone is happy. I actually built the frame of this new shed over a year ago, and then decided to allow the beams to dry out, and things to settle, particularly given the rather steep pitch I’m dealing with. Here’s how things looked on 15 May when construction resumed, and two weeks later in the second photo. My second assistant, Ace Champion Helper #2, Omar, optimistically hopes we’re building a very special dog house. 1 June. Getting the roof beams situated, lattice begun, and staining. Treated lumber is my least favorite choice for building anything. This is not so much for the environmental concerns, as the industry has removed arsenic from the formula today; now all we have to worry about is the copper. However, given the steepness of the grade on which this foundation is laid, ground moisture is a concern, and so the upright supports have to be anchored nearly three feet below grade. No, my objection to treated lumber is more about the quality. The worst lumber that can’t make better grade is relegated for sale as suitable for wet locations. One has to inspect and select each piece carefully. Sticks can be unusually knotty, fractured, warped or with rotten spots. The mills usually sell them as wet as possible, a tactic to defer the eventual bending, twisting and spiraling into the hands of the inexperienced builder. To remedy this, I like to assemble structural parts as fast as possible using heavy hardware to preserve straight. As it happened at Bayside, everything held up during the drying phase, except for one roof truss which twisted so badly, I had to replace it altogether. It was a 4×6 beam which contorted over the winter and pulled ultra-heavy 5/8″ hardware right through the anchoring post. Nature is amazing! To diversify my labor and sooth my verdant soul, I checked on a few of the native and naturalized species that I’ve installed over recent years. The deciduous ones never fail to thrill me as they present their spring wardrobes brand new each year. Here are a few. Athyrium dryopteris erythrosora, called Autumn fern by some, is a close relative of the Lady fern. 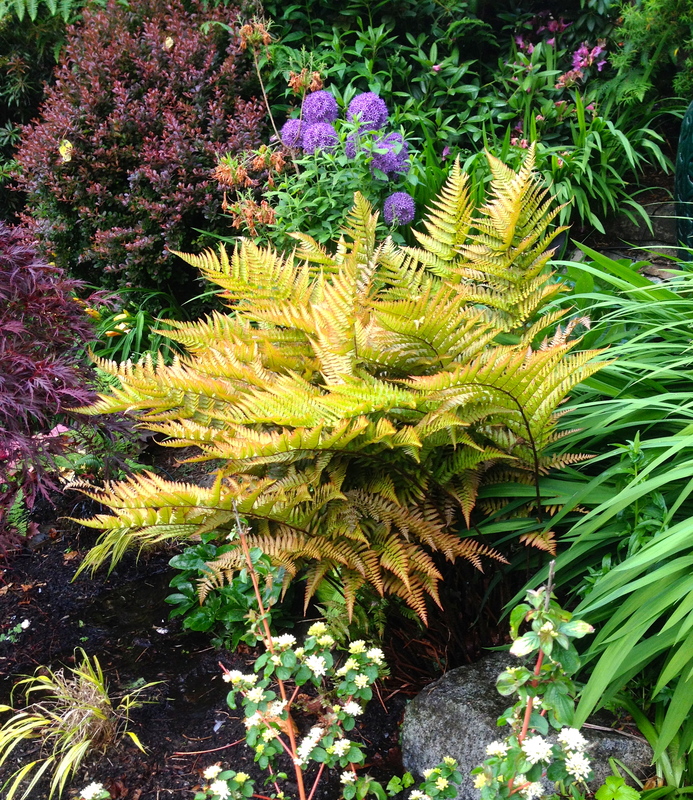 Cut these fronds down in the winter (though they are persistent enough to be called “evergreen”) and you will get a thrilling fresh display in spring. The amber/copper-ish color turns to green as summer arrives. 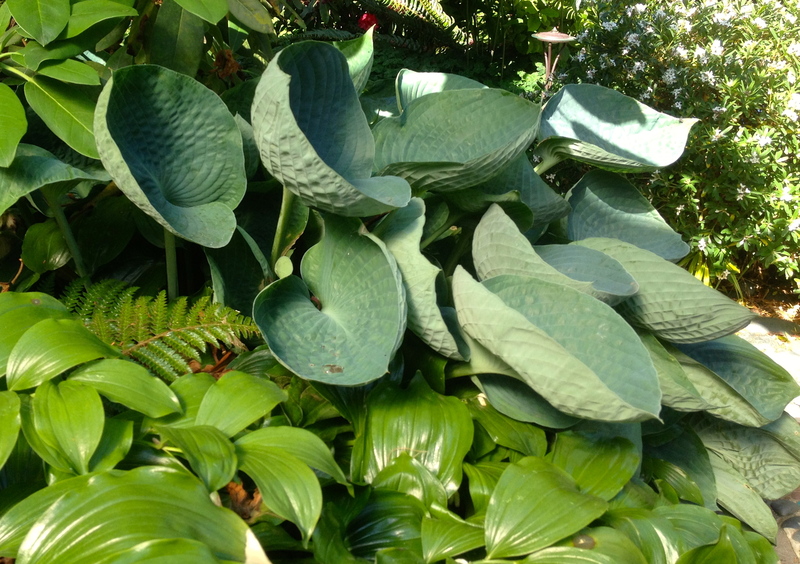 Polygonatum commutatum, called False Solomon’s Seal by some. You have to lift up the fronds to see the springtime white bells beneath the broad foliage. Three maples converse among each other near the home’s entrance. 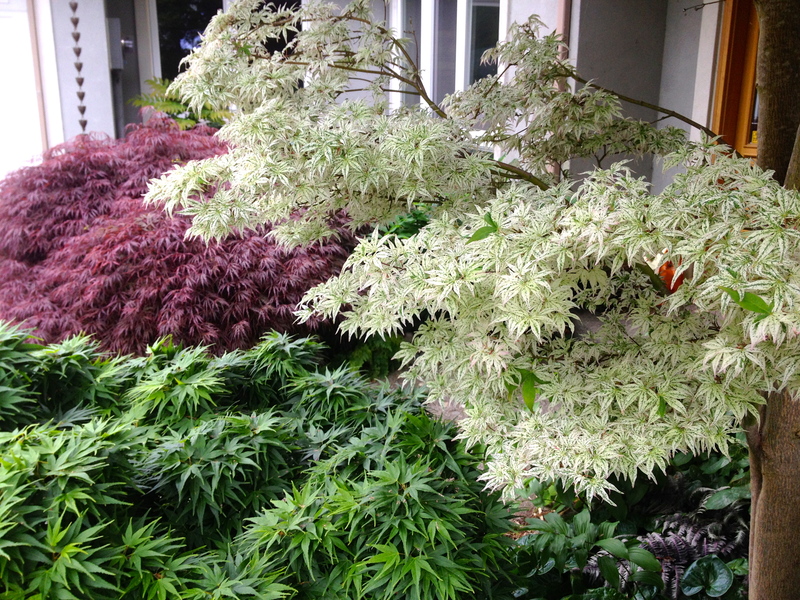 Clockwise from white: Acer p. Ukigumo, Acer p. Mikawa Yatsubusa and, Acer p.d. Inaba Shidare. 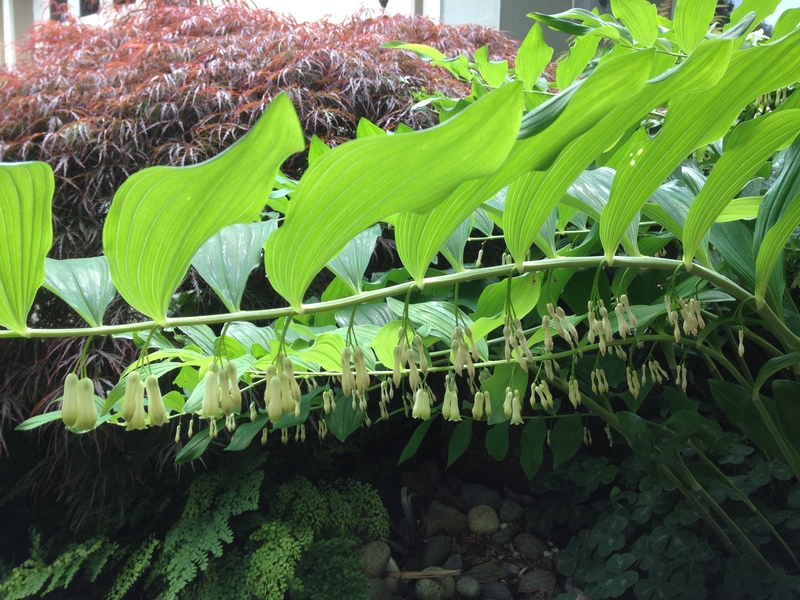 Hosta and Solomon’s Seal (P. europeam) contrast and fit together great. Glossy vs. flat finish, green vs. blue. California poppy, Eschscholzia californica. Satiny, iridescent charm. A 10-year-old boy can’t stand to sit much longer in that school room, dreaming of the freedom to be outside exploring, examining, fantasizing about trips to the ocean to dig clams, to the mountain to find huckleberries, to the woods and fields to find adventure. But it’s only April, and the cruel Pacific high pressure ridges have warmed up the landscape. Trees have their leaves, flowers are blooming everywhere, even fruit trees are beginning to bear tiny apples and cherries. But no single blossom makes a boy’s heart ache for the summer sun more than that shiny, brilliantly orange ubiquitous California poppy. And no matter how many time he grabs a fistful and runs full hilt all the way home to present a mangled bouquet, his mother never once fails to be delighted with the gift. That boy of course, existed in 1970. Today, there’s a much older boy with no mother left to bring a bouquet. 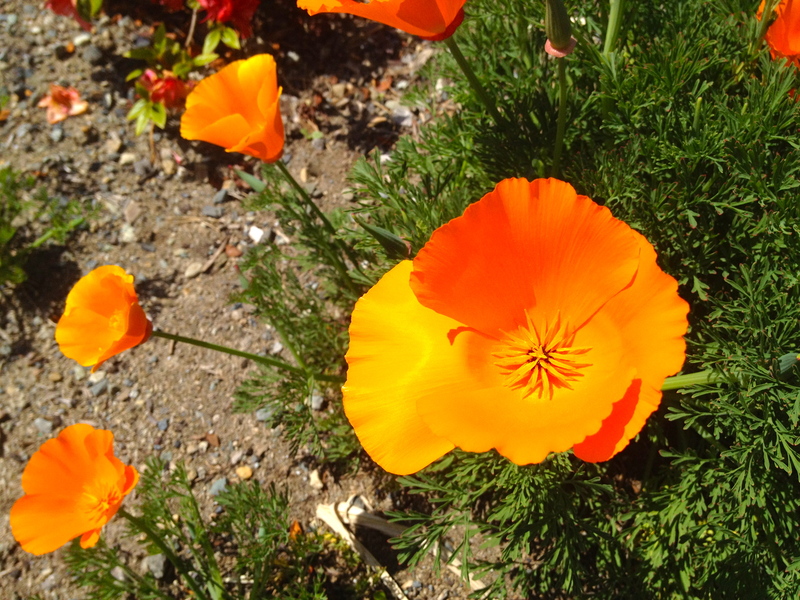 But when it comes to omnipresent Eschscholzia californica, his mind still recalls the energy that one tiny flower, the color of childhood, can infuse. These cheeto-colored blossoms can be found primarily in rural fields and roadsides. They spread like wildfire in all dry sunny locations. To simply throw some seeds on a forgotten or neglected patch of soil is to generate a bright orange triumph the following year, often, if you get some rain, the same year. Frankly, I can’t see the harm in spreading some orange charm in abandoned alleys and lots. The retailers sell these seeds in a packet…cheap. A couple of rains is all it takes for these guys to flourish. For all of that effort, who knows, maybe some mom somewhere receives a humble bouquet, and her day is a little better for it. Extremely uncommon Rhododendron Hokkaido; yet another yakushimanum hybrid. German bearded iris Batik bathes in afternoon sun. Rhododendrons bloom over a 6 month span around the Northwest. There are a few hybrids that begin to show early in February and throughout March. There are even a couple I have seen regularly open in late January. The benefit of these early season varieties is that their blossoms last extremely long owing to the cool winter climate. 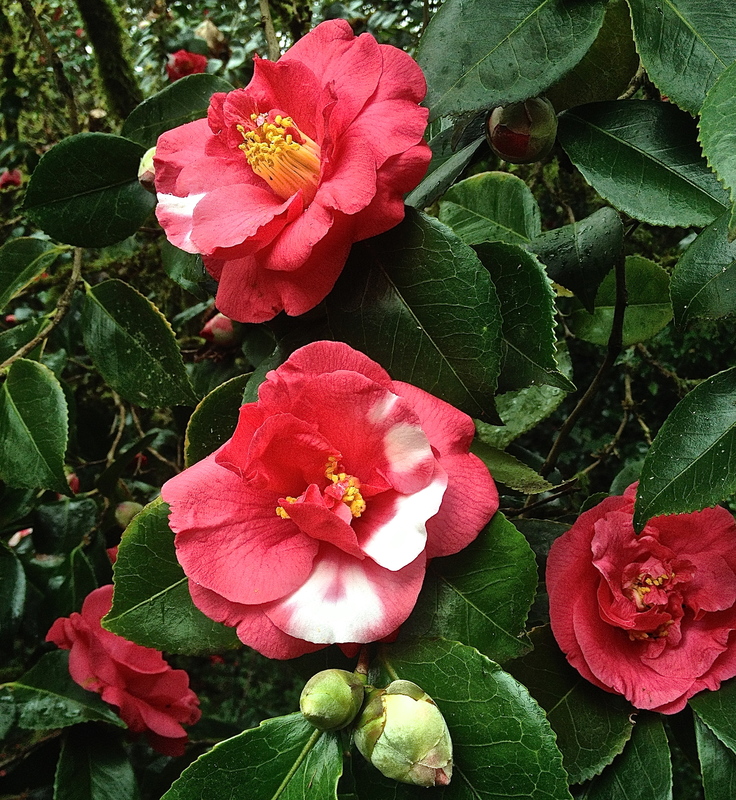 In April, the list of species and varieties that flower expands tenfold. The spectrum of flower colors is so wide it even includes shades of green and brown. But April is just the set-up for May; this is the month that the ball gets spiked (stay tuned for abundant rhody blossoms next month). It would be easy to be so distracted by rhododendrons that one misses all the other exotic floral species coloring the landscape. Jack-in-the-pulpits are up and out of the ground, Chinese tree peonies are as dramatic as ever a flower was, irises of all types–Japanese, German bearded, Pacific, Siberian, etc.–paint the landscape. Even the apple trees are for a moment as beautiful as a blushing bride. 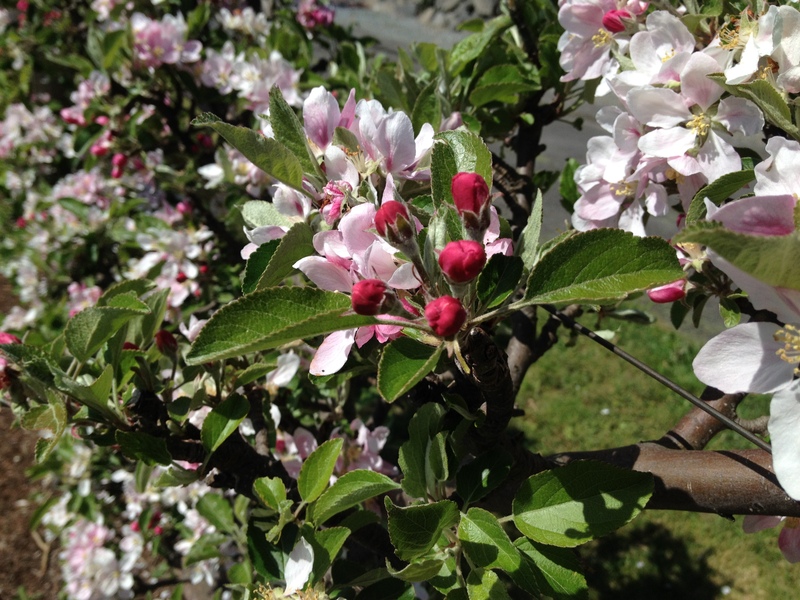 These perfect Fuji blossoms signal the quality of the crisp apples to follow in a few months’ time.